You are wondering, no doubt, what is IZNT? 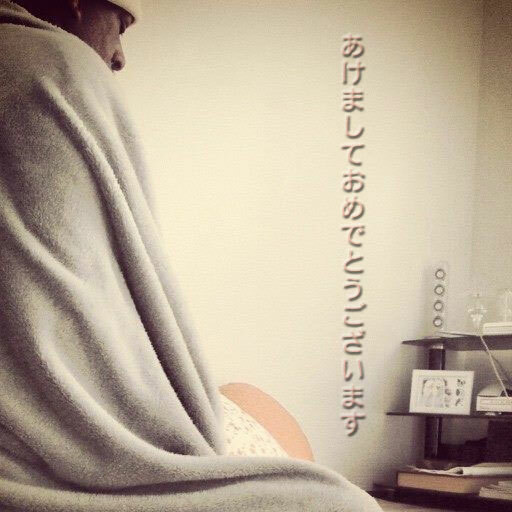 There is Facebook page called The Kobe Blues Socity. I joined many months ago. 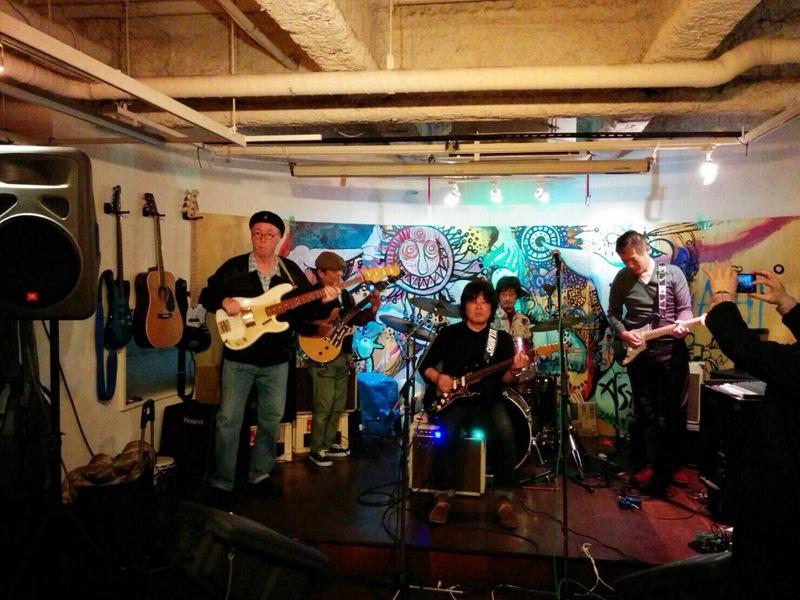 I finally got around to putting up a post about our Koyto Concert. I thought it was ok, I had seeen other posting of that sort. Well short story, it was not. It was not a big deal but there was mention about attending a monthly Jam in order to get ot know people. The Guitar player and I decide to go. Our drummer can not. Another friend knew of this place, he did not have a lot of good things to say about the Blues Society “leader”. Also there was past conflict between them and also our guitar player. However our drummer laso know him and has nice things to say. I say I am keeping a open mind with no expectations about the evening. I had been told, by the “leader” that 1/3 of the players are Pros or ex-Pro players, and to keep that in mind. I was not not sure what that meant. My reply was, I can flow, not worries. We arrive the “leader” is on stage practicing with some guys. The place is still pretty empty. 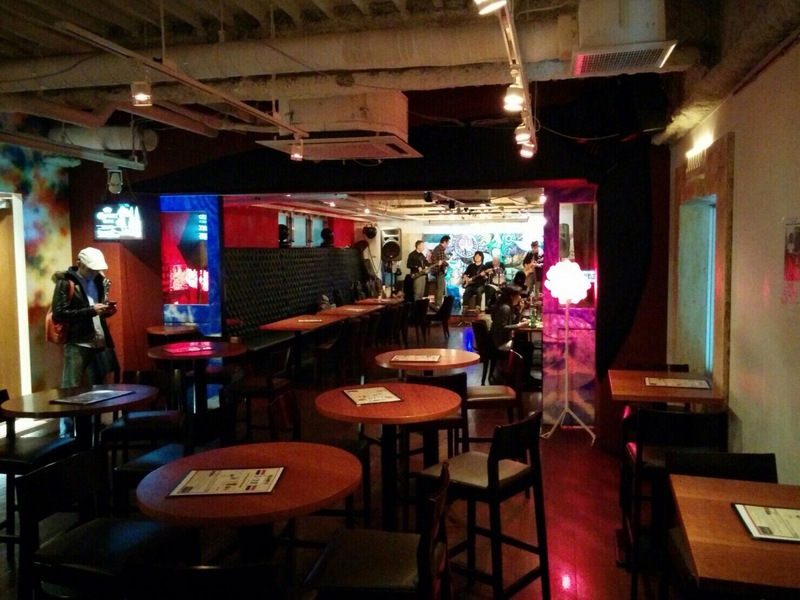 I take a look at the menu, which is pretty good, even for me to eat. I order, and get a home made Sangria, surprisly good. I sit, I eat, I take pictures, the “leader” finishes and come over and introduces himself. Hmmmm, his English is good, his vibe is …hmmm not bad, not good. He however not that way with my guitar player, I could feel the chill. The Leader goes off and chats with others. I hang out as more people comes in also some of new players entering I know. Some time past, our friend who came with us, is the Bass player that I sub with at the Mosrite Club. He goes up and plays with the “leader” as they were in the same band before. After it is over I am given the ok to come up with my guitar player. There was to be a drummer to sit-in with us also a second guitar. Perfect I thought. I say what song and the key. The song “Hoochi Koochi man” starts slow but with a beat, the drummer never got it going. I kept using my arm motion to indicate the beat! He never got it, it was difficult to play with him. The Bass and Drums need to be the in thump and bump harmony. His beat was off and weak when it was on time with a weird pattern. We made it through the song but I was not happy about it. Next song up I gave the signals beat and started the song all he, the drummer had to do was fall in. It never happened, wrost than the first, I could not even get not the song. After it was over the leader came and brought up some different players. I was done for the night anyway, that last song was more than enough, to spoil stomach. There was a bit of discussion afterward by my friend the other Bass player, about I did I feel about the set. I told him it was the worst drummer I had everlayed with in my life! Yukkkkk!!!! There was some question much later of we had been given a bad drummer on purpose. I did not want to speculate on that path much. For the last few days I have had a lot of thoughts on passing from this life. I have been meaning to write some down, but, got busy with stuff. Still the th ughts have been in the background music area. LZ gets depressed, at the end of the year, say ehhhhh, another gone, we are reach our end, our years grow faster and fewer. I of course reailize that also, I just do not let it take over my emotions. Generally do not think about it in depth. I recall a Chan book saying, something like, a Chan mind is living life, practicing for dealth. Always ready for dealth, by living fulling in each moment. Last year my last alive Uncle on my father’s side, wife passed over, shortly afterward, my last alive Aunt on my father’s side, passed. It was hard on my Uncle, he lived within blocks of his last sister. That got me to thinking truly about the passing on of time and changing of generations. I am guessing his training helped…hopefully. 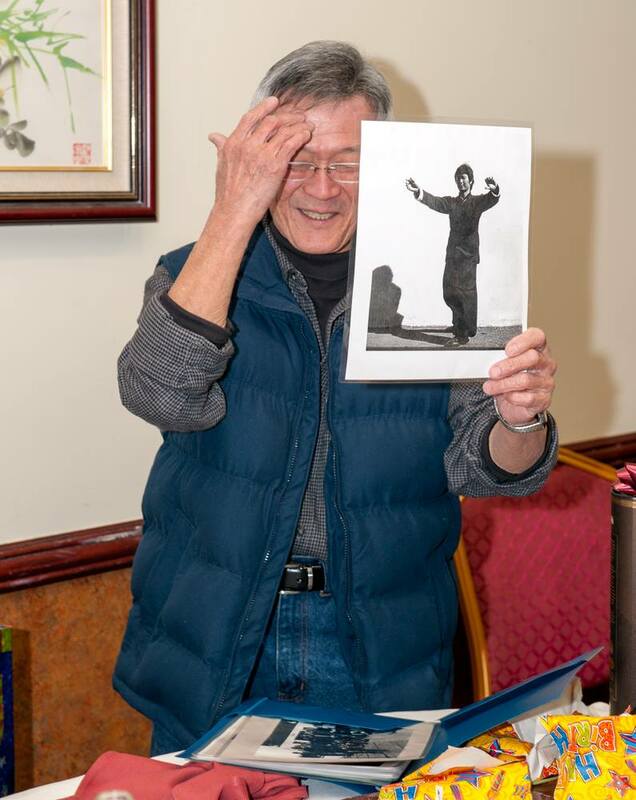 Today is Shifu’s birthday in the states as I write this, I wrote to his son yesterday. Today I received the news Shifu passed away today on the anniversary of his birth. I am sad beyond words. When I left the states a couple of years ago, I had a last Friday night closed-door ( private for only senior students and those with invites) practice session him and my classmates. I had a feeling then, it would be the last I would see him. I shook it off as my morbid side taking over in front of the big sailing journey ahead. Sometimes I hate being right! Those who have studied in an “old school” style martial art they understand the Sensei/Shifu, student relationship. The word Shifu/sifu also means father in Chinese. We think in Kung Fu circles as “sifu/shifu” as the father, classmates brothers and sisters. My relationship with Paul Eng is like me the adopted son. 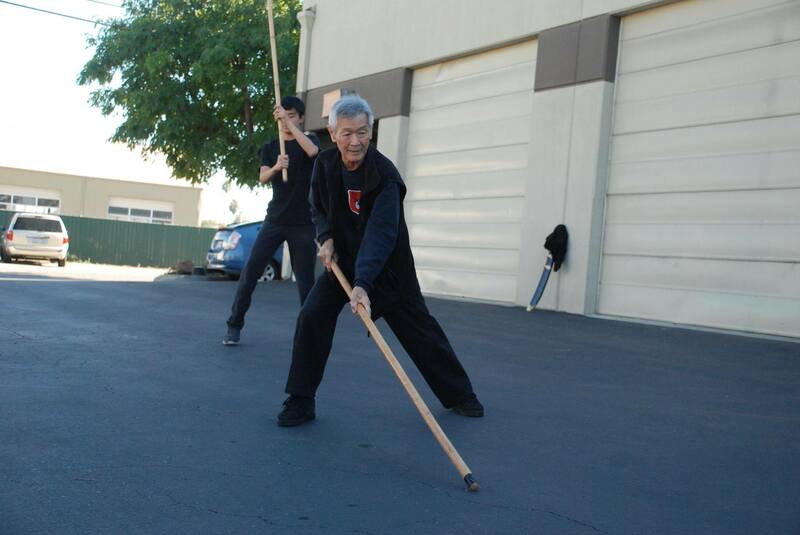 This being I was already a “graduated” instructor when I came to train with him and my teacher was a blood relative as well as Kung Fu relative. My school was part of “outside” or black sheep group of the Northern Shaolin Tai Chi Praying Mantis group. We were labeled as “hollywood”. 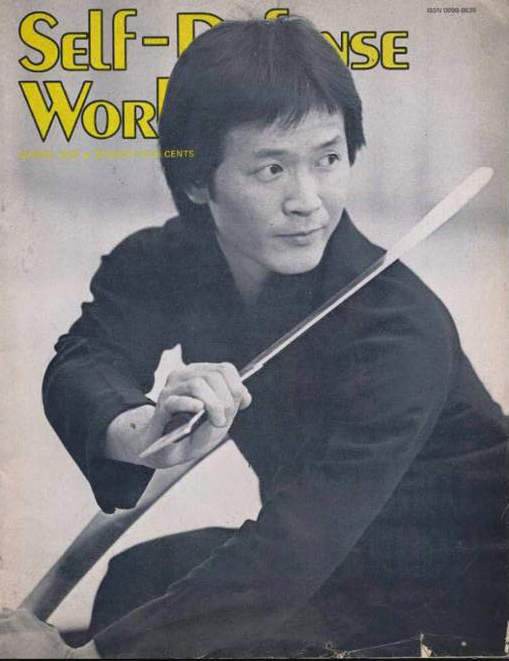 My Shifu at the time thoughts and actions where outside of tradition, and he was well involved with “hollywood” and the movie scene. I left the LA school to open my own, then afterward again relocated to Northern Ca, where I went to studying with Shifu Eng. 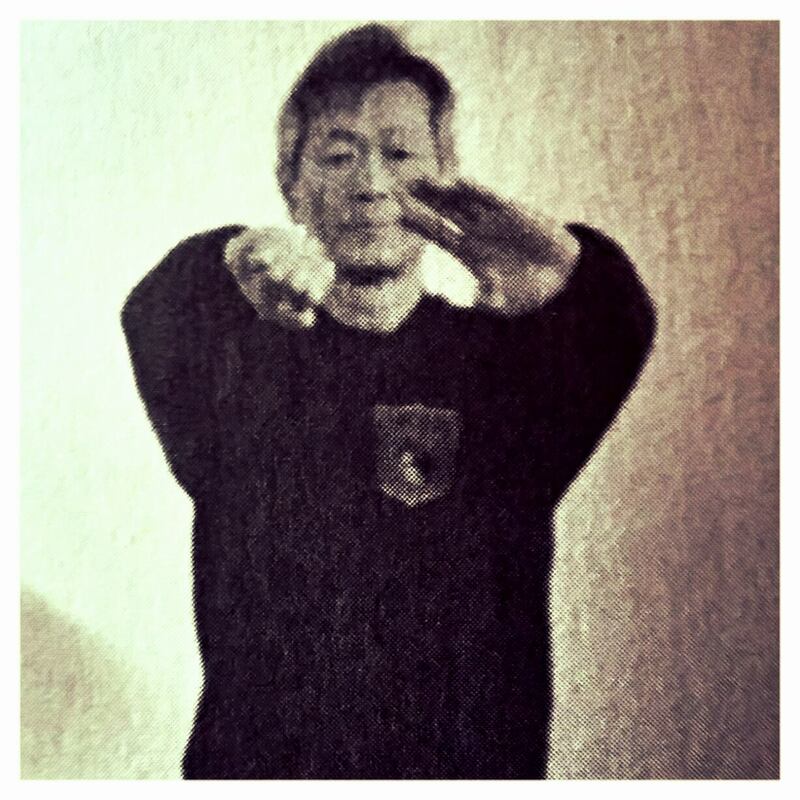 Through the years I was accepted more and more within the main group, the U.S. Chuk Kai Tai Chi Praying Mantis Federation. That took, effort and is a whole “nuther” story, the new years. I was sponsored to join the main federation by Shifu Eng and another “uncle” as my old Shifu had retired from the martial art world. Through the years I continued to studying with Eng Shifu, sometimes with an absence due to life conditions, gas prices, transportation. It was about a 2 hour drive to the school. If I was out of work, I could not afford to travel. 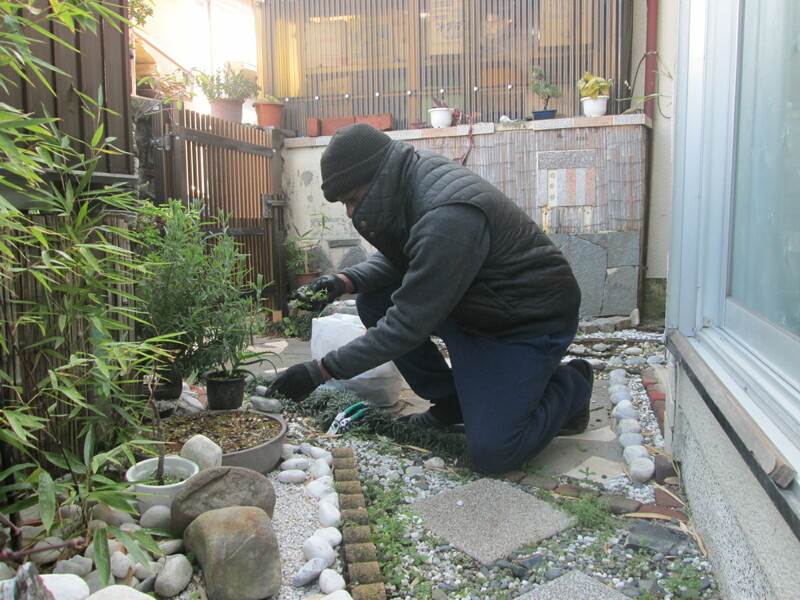 As with others though, I returned to continue training. Over the years I was considered more a part of Eng Shifu’s school, by the Federation but at the same time, separate because I had my own school. I had two identities. I was always invited to school events. Shifu knew I did not eat meat so would always make sure there was something there for me to eat. He knew I did not drink beer or whiskey, so would always give me a cup of his brandy or cognac. Anyway, I was treated as family, more so than I was by my former Shifu. I alway found this heartwarming. 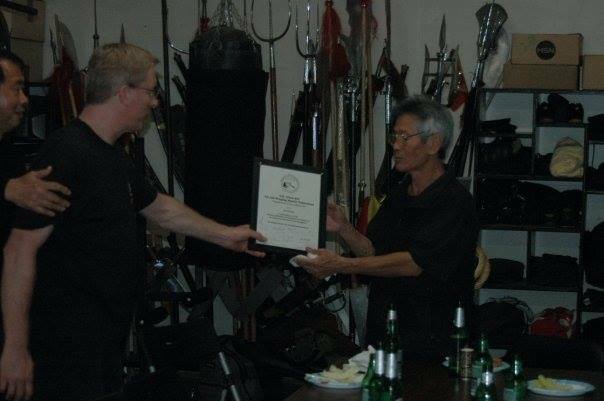 I started training with Eng Shifu about 1983 until 2012. I remember in my early days of training with him being surprised at how many students had been with him over 15-20 yrs. Most students stayed 6-7 yrs average with a teachers in the states, those are dedicated, rare ones. Shifu could be fearsome at times with his temper, everyone jumped when he got pissed off. It was not often, but shocking when it was shown. However he will be most remember by his kindness, patience and teaching skills. He truly loved his students, I remember a couple of times seeing tears of joy at some school gathering and at his birthday party two years ago. I am so pleased I sent him a little something just before Christmas, he knew I was thinking of him in his dark hours. He will be greatly missed. There is a mass of condolence messages posted on FB on the Tai Chi Mantis Page. He touched a lot of people in his long teaching career. 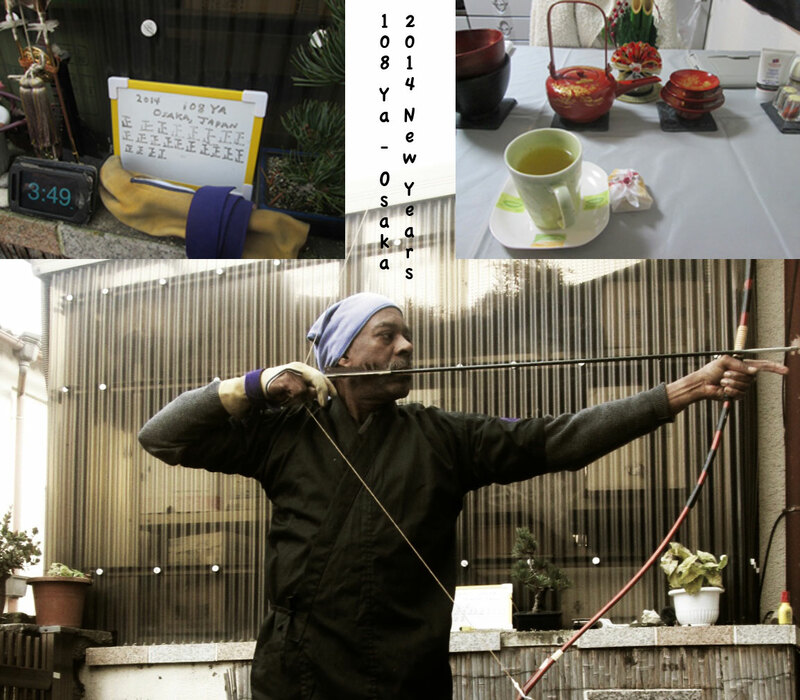 I am off today and had planned on going to Kyudo, with the news, I could not. 2015, year of the Ram/Goat/Sheep….? So far just trip’n: Random thoughts and reflection starting the year. He holds…I hold…both blank stone faces sway with the train. I settle into mirror-mode jitsu. He folds and yields, I shift awareness to the bay in the distance through the glass of the access doors. The wheels of the train squeak as we roll. No one knows of the drama among them as they sway in time with the train, lost in their own worlds. Oblivious, to the primal struggle of man against man in their mist. The vanquish challenger quietly exited with his female companion. I considered a nap. The train rolled on. Part of my approach to the new year is reading the I-Ching: how should I deal with/ approach this year? 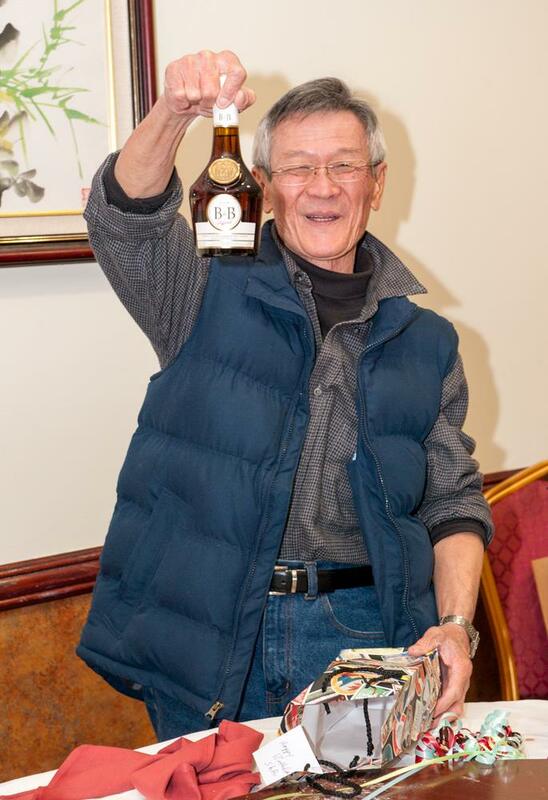 Khien indicates progress and success. The superior man, (being humble as it implies), will have a (good) issue (to his undertakings). The first SIX, divided, shows us the superior man who adds humility to humility. (Even) the great stream may be crossed with this, and there will be good fortune. The fourth SIX, divided, shows one, whose action would be in every way advantageous, stirring up (the more) his humility. Făng intimates progress and development. When a king has reached the point (which the name denotes) there is no occasion to be anxious (through fear of a change). Let him be as the sun at noon. Six at the beginning means: The first SIX, divided, shows us the superior man who adds humility to humility. (Even) the great stream may be crossed with this, and there will be good fortune. Six in the fourth place means: The fourth SIX, divided, shows one, whose action would be in every way advantageous, stirring up (the more) his humility. The future is: ䷶ – 豐 (Făng) / Abundance [Fullness] Făng intimates progress and development. When a king has reached the point (which the name denotes) there is no occasion to be anxious (through fear of a change). Let him be as the sun at noon. The fifth SIX, divided, shows one who, without being rich, is able to employ his neighbours. He may advantageously use the force of arms. All his movements will be advantageous. Hsien indicates that, (on the fulfilment of the conditions implied in it), there will be free course and success. Its advantageousness will depend on the being firm and correct, (as) in marrying a young lady. There will be good fortune. What is really interesting is the “Modesty” figure showing up each time. Something that I have never seen. I have been giving thought to my life direction, comparing now to a couple of years ago. 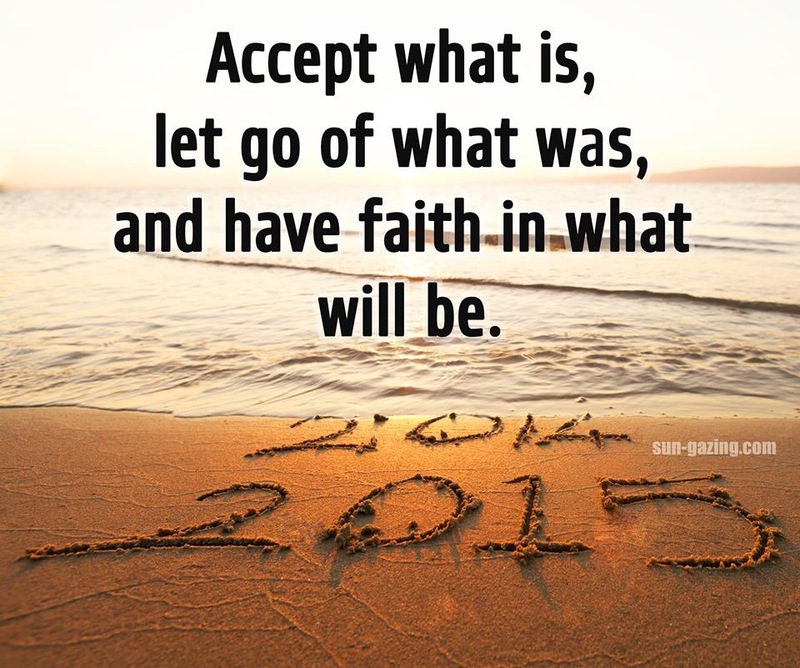 Happiness, fullness, accomplishments , direction maybe most. Some who read my blog for a number of years, told me she felt I was going in the wrong direction. I did not laugh as before. Hmmm, interesting to judge that from my blog and facebook. Still perhaps true. There were/ are several levels to recovering from the lost of Zen II. I do feel more grounded in my “plans”, hopes. Another friend, a Chan sister, asked me for advice on how to live on the edge, live with uncertainty, and still be happy. LZ also had a similar query. Hmmm, I would not say I am happy… I am not unhappy, and that is in a sense, happiness. I have moments of happy happiness, but more I am on the “middle” sense. Perhaps I am naive in continuing to feel things will work out, and sometimes I feel pretty depressed being still, but knowing that is the only thing I can do at times. 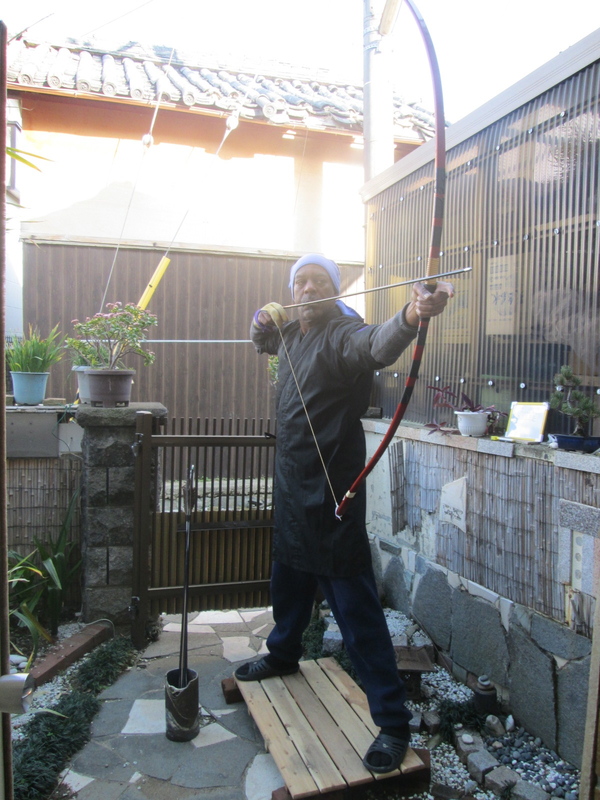 Yon-dan in Kyudo. Not a big deal even within the Kyudo world but in my head a milestone in personal training and that goal I sought on the start of this Renmei path. I had planned on reaching Yon-dan then retire from shinsa. I can understand the value of “exams”, and have re-set my personal within the renmei goals. Still there is question, “is it all about shinsa and Tai Hai’s”. I have made an introduction connection to the Muyoshingetsu clan. I will pursue visiting a class in the spring after Shinsa. It will be another pilgrimage as it is a several hour journey to reach where a class is held. Start Shakuhachi lessons. I can get sounds and entertain myself, however I would like some formal training. Then I can explore more of Mixing Styles for some original songs, sounds. It would be good to spreadout more musically than just doing the Blues. 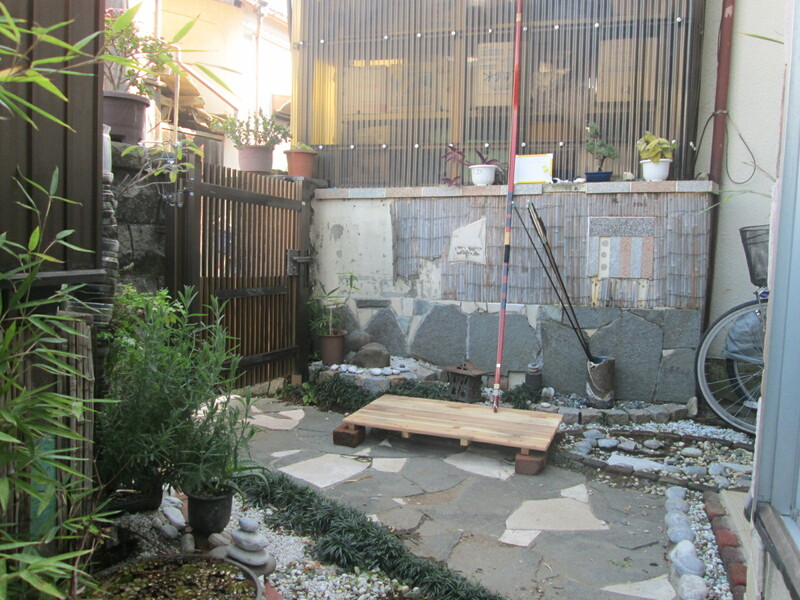 There are several of the Sempai at Kishiwada Kyudojo who play Shakuhachi at the dojo. I wondered the other day whilst playing mine, if the lessons helped to train the breath control. I will ask someone At the Dojo about an introduction. Tai Chi/Kung Fu class going. The first one fizzled out at the cultural center. I have another, perhaps better location on the radar. Getting the students is the real challenge…yosh! I will be dropping my current Japanese language class and finding another. The one I have now, is kind of “fun” but, I am not really learning, improving my Japanese skills…seriously. I want to/need do that. No real sailing plans other than to get out more since I know I have boat access. No big sail away dreams. I still want to sail the inland sea and visit islands… However I am not thinking about that for a couple of years. Somewhere in that “5 yr plan” formation. Another thing is to do better with my Chan class and personal practice. Part of being able to do that is to better my Japanese. I need to guide the students better. As for the band. Hmmm, i would like to expand our song base, and do some other songs. Our current “house” status is ok. However I would like to get into some other clubs, expand our musical base. Starting some time near the end of the month I will go visit some other “Jam” venues, , meet some other musicians. Maybe I will end up working some with two bands. People do that here. Well this has been a pretty long post about me doing nothing for a change. It is also getting late on the last day of my vacation. In the morning I am back to to Silver Center for rak’n stuff. Unless it rains, which is expected. Like the Universe is saying, here dude have another day of chill’n. As it turns out, I got my extra day off. The rain did not start early enough for me to stay in bed. I got up and ready for work. However just before I was ready to leave I detected some rain fall, with the sky saying more is coming. It was the correct call as it is now raining proper. Even if I went in the day would have cancelled shortly after. Rather than just go back to bed I will be productive at least for a while. First step publish this. The planned 108 at the Kishiwada Kyudojo, did not go as planned, that happens, ne! So It is now New Years Eve and the 108 is done. I decided to do something different and make it a day of training, and meditation. I started early in the morning with some Yin meditation. Siting Chan. After light breakfast of tea and toast I went over to the local “Jinger” (shrine) for some motion Chan, some yang meditation. 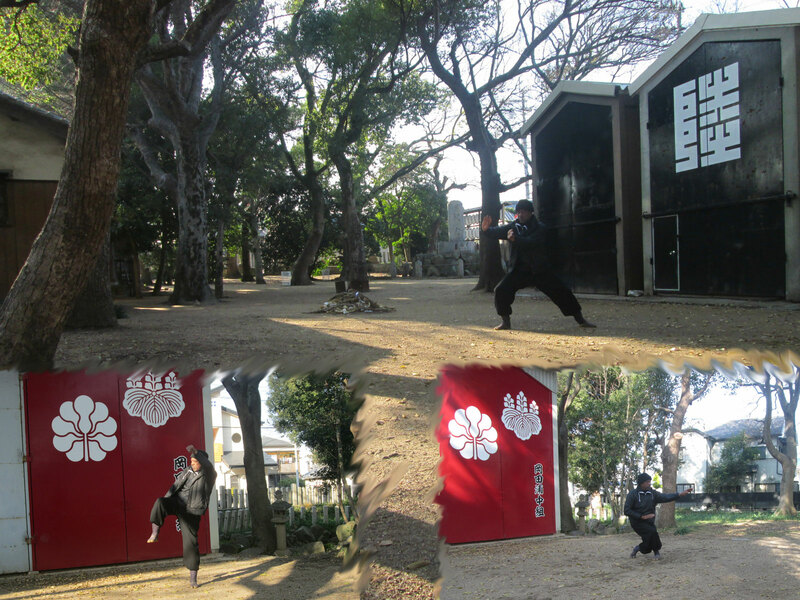 I went through my three short forms of TaiJi, Yang, Chen, Chao. Afterward Hsing-i combined set. That was followed by Bum Bo Mantis. The weather was perfect, cool, but comfortable, when dressed for it. Sunny, and pleasant. Nice to feel the morning Chi at the Shrine. My next section to my day of meditation, after some tea and a small cake is some garden work. Trim some plants, pick-up stuff, pull some weeds. Basically for me clean the Dojo. Prepare for the afternoon shoot. Again a short tea break, before changing to shoot. I opted this year not to do the hakama. It took a short time to do some misc tasks needed before beginning. Once started, I found myself reflecting on how much I learned over the past year. How how my shooting changed. What I still need work on, correcting items for the last instruction, Tenouchi, relax upon Hanare, drop shoulders. A countless array of thoughts, things to remember but do and do not attach to the thought, or the next one…go with the flow of the moment, the flow of the river and wind, riding to your destination, …but stay in the boat. That may not make sense to you…no matter. Doing the 108 is not a matter of shooting 108 arrows. Each arrow is a “vice”, a meditation, a sin, a treasure, a burden. If one just shoots to get off 108 arrows, it is a waste. It is like doing TaChi thinking of what is for dinner. 108 chances in a row to be totally in the moment, refining, every thought, movement, muscle down to one point. 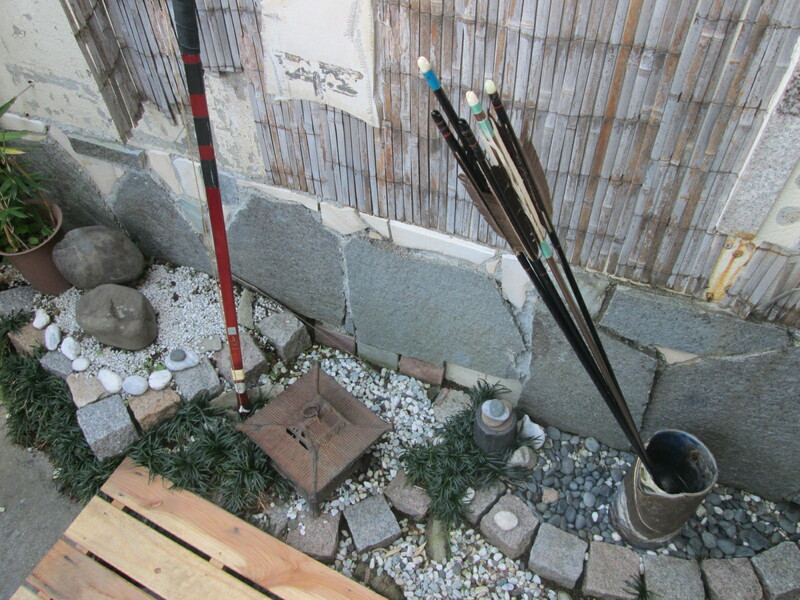 That is my trip, just shooting 108 arrows is good even mindlessly, takes a certain spirit and dedication. Lunch time at the halfway mark…more or less. 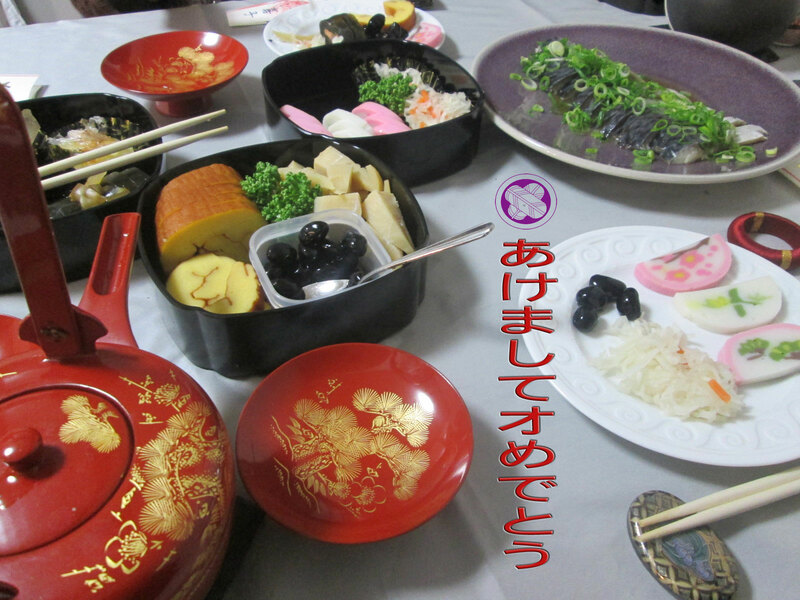 LZ had off during the day and did the New Year cooking stuff thing. She gave me soba noddle kitsune. 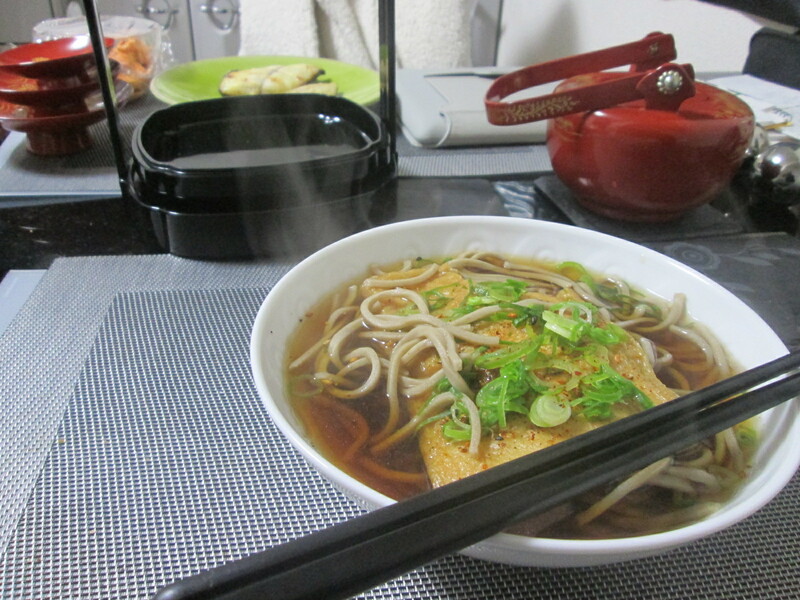 Maybe it is called, Kitsune Soba. Whatever. Ot was good. Warming on a chilly day. The completion of the 108 went without a hitch. I think I made or am making breakthrough. I noticed how my shots got more and more in a tight cluster. There was a few timing when things felt right with a shot, even the sound of the string changed and sound almost musical. Even though a had an interruption from the OBa-chan from next door. It was a good afternoon meditative practice. It was nice to not have cold hands and feet while shooting, like last year. It has been a year to be grateful, thankful on many levels.